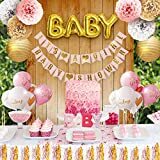 ❤️ 42 PIECE SET: includes 2 beautiful banners; 1 "BABY" balloon; 15 balloons; 6 paper poms; 2 round gold paper lanterns; 15 tassels; and 1 "Mom To Be" sash. Elegantly appoint your baby girl shower easily and without stress. ❤️ FREE EBOOK: to help plan your baby shower. From the venue, invitations, baby shower games, party supplies, backdrops, and etc.. Our comprehensive eBook will help you plan your event! ❤️ HONOR THE BLESSED EVENT: shower your best friend in good wishes with our baby shower decor. Adorn her in our satin "Mom To Be" Sash to ensure a memorable selection of photos for her baby album. ❤️ PRE-STRUNG BANNER: measures approx 50" in length and boasts 4" letters. Frame it with our 2 gold-tone 12" paper lanterns over Mommy's place ofn honor. Lanterns ship flat and will expad easily upon unpacking. ❤️ DECORATE THE GIFT TABLE: in pink, gold, and white tassels with pink, pastel rose and white tissue paper poms suspended overhead. You also receive 3 pink Girl balloons, 3 white Heart balloons and 3 white Oh Baby balloons.